The Asset Delivery feature is one of the biggest new additions we've made to the Thrive Leads plugin since its release. With this feature, you can now automatically send links to your downloadable opt-in offers to new subscribers. 1) ​You can make highly relevant opt-in offer such as content upgrades and automatically send the right download links to new subscribers. 2) You don't have to set up a separate thank you page, separate list, separate follow-up sequence etc. for each new opt-in offer you create. Another advantage of this feature is that it can "upgrade" a simple autoresponder system. We generally recommend ActiveCampaign for email marketing because it uses a tagging system and makes it easy for users to create audience segments and send highly relevant messages. However, if you use a list-based autoresponder service, things are a bit different. If you have to create a separate list of subscribers for each one of your opt-in offers, you soon run into trouble (and you also pay too much, as any subscriber who signs up for more than one list will be counted more than once). Asset Delivery is the solution to these problems! With the Asset Delivery feature, you can potentially send links with download emails to every new subscriber who opts in. Since the server that hosts your website is not an email server, that could quickly lead to problems. Basically, lots of emails being sent through your WordPress site is a recipe for getting those emails caught in spam filters. Both of these are email delivery services, built for exactly the kind of use case presented by Asset Delivery. And even better, both have very generous free tiers. With Postmark, you get 25,000 free email credits when you sign up and with Mandrill, the first 2,000 emails you send are free. When someone signs up through a Thrive Leads opt-in form that has an Asset Delivery group assigned to it, they will receive the email with your download links immediately. 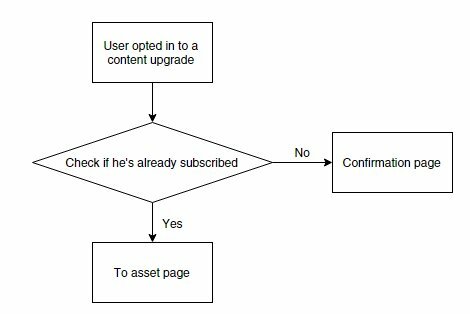 You may be wondering: what if you use a confirmed opt-in process (also known as "double opt-in")? The short answer is that using Asset Delivery changes nothing about your email autoresponder setup. ​Thrive Leads will send the Asset Delivery email, as you specify and it will send the lead information on to one or more of the services we integrate with. What those services do with the new lead is outside of our control. My recommendation is that you use the Asset Delivery feature only with a single opt-in process. For confirmed opt-in, it makes much more sense to send the subscriber to your download page as soon as they click the confirmation link. The typical use case for the Asset Delivery feature is that you send your new subscriber a link through which they can download something like a PDF report. However, that's not the only thing you can use the feature for. By using the "Insert from URL" option, you can add a link from your Amazon S3 account, a link to a landing page (e.g. with an embedded bonus video) or any other link you want to include in the asset delivery email. Since we updated Thrive Content Builder to Thrive Architect, the Thrive Leads interface has also changed. As mentioned above, Asset Delivery in Thrive Leads is especially useful for creating content upgrades.​ And it's only one in a series of feature additions we're working on, all aimed to make content upgrades even easier and more effective for you. What are your thoughts on this new feature? What else would you like us to add? great feature! i’m very impressed by all the new functionality you add. There is an plugin named surveyfunnel plugin available which do the same thing which you mentioned in your point one with more feature. I am using it from many years. Although I am not satisfied with it yet because of lack of proper response but it is the best available in the market place. I also requested to Shane about it and I am hoping that shane understand that this is a great idea for thrive themes and add too much value in their memebrship site. Would this work for selling ebooks? This can’t be used to sell downloadable products, no. I liked it a lot and see the potential, but i don’t see how you can use it to segment your list! It doesn’t segment your list for you, that’s still up to the email marketing system you use. But it makes list segmentation a lot easier because you no longer have to create a whole funnel and follow-up for each opt-in offer you create. great piece, but in Germany we have a very strict privacy system, without double optin process works nothing. That’s something we can’t cover with this feature, of course. But in this case, you have to create a separate follow-up for each offer anyway, so I don’t think there’s anything we can do to make it easier. Why not make a new update that after the double confirmation, you can download all the resources direct to your email as they do with the simple confirmation? Can not check on the list? If a user is already registered (after going through the double confirmation process), they will be sent the eBook direct to their inbox. This is something that would require a much more complicated API integration with the email marketing system you use. And I’m pretty sure that most systems wouldn’t even have this as an option in their API. If you want a setup like this, I think the better approach is to handle the asset delivery within your email marketing system. Love the updates and additions. As a web consultant I own a lot of CMS systems. Many are stale, one was ruined by a massive re-code, however Thrive is rocking. I do have trouble keeping up with all the new upgrades and features, but that’s a great problem to have. This asset delivery feature is going to be great on two of my sites and one of my client’s sites immediately. Besides easy delivery, I see everything in one spot. Now I have to hunt around in my or my client’s mail server. What if your assets are WordPress pages? Is it possible to set those up as assets? This is brilliant, there is one thing I would like to ask, can you specify download Url’s other than from your WordPress host? I couldn’t see a edit button for the URL. Thanks Paul that is fantastic, really great stuff. In the WordPress media manager (what we use for selecting and uploading files) there’s a custom URL option as well. Thank you, Shane, for another great feature. Can I just ask that you make sure it’s added back into the Knowledgebase. I’ve just been bitching on the forum about the absence of other great stuff that I’ve lost track of in these blog updates and when I come to use something and need a refresher there is nothing in the Knowledgebase. Constructive feedback! :-) I can’t really complain about a service that keeps delivering as Thrive does. Here’s the knowledge base entry for the Asset Delivery feature. Fantastic. You amaze me. I was just looking for something like this. So glad I joined the community! Sounds like a great feature! Is it similar to Lead Magnets? And is this also easy to integrate with Aweber? I don’t quite understand it completely yet. 1/ Imagine I have a new downloadable offer, and someone subscribes to this offer, he will immediately receive the download – but when this person is already in my email list, will he receive also an automated message (from aweber) “you are already subscribed to my email list”? 2/ And does this new feature cancel the double optin process? Does the subscriber still need to confirm the subscription by clicking a confirmation link in his email? Or does he simply gets a download directly, without having to confirm subscription (if he is not already subscribed in the first place). 1) That depends on your email marketing service. What we do is send the download link whenever someone fills out a Thrive Leads form. And we do that, even if it’s the same person signing up multiple times. What your autoresponder does with the lead is outside of our control. 2) Again, this is outside of our control. We don’t require an opt-in confirmation for the download link to be sent. If your autoresponder is set to confirmed opt-in, the new subscriber will receive the Asset Delivery email with the download link (from us) and the confirmation request email from your autoresponder. Thanks, ok! Will test it out myself then, when I have installed it, to see how it behaves itself. Aweber is adding also the campain feature, it is in beta testing now, also giving the option to send automatically emails in different languages, depending, as I believe, from the ip address. Brilliant move. Thanks for making this part so simple…and for the random question at the end. That was both funny, and a good lesson for all busy entrepreneurs who are surrounded by distractions. Thanks for introducing this feature. Just to clarify, when someone opts-in for the lead magnet, will they receive the link to download as soon as they click to submit their email? In other words, will they get the lead magnet bonus before they have to confirm subscription that’s sent from from my email provider (double opt-in emails)? What your autoresponder or email marketing system does with the new lead is outside of our control. We don’t require an opt-in confirmation for the download link to be sent. If your autoresponder is set to confirmed opt-in, the new subscriber will receive the Asset Delivery email with the download link (from us) and the confirmation request email from your autoresponder. That’s correct, yes. The same is true for emails you send via your autoresponder, though. Personally, I don’t mind people getting access to my free stuff without opting in, if they find a way around it or get it from a friend. My free stuff is amazing and more people seeing it is generally good for business. Fantastic! I’m in the process of migrating from another plugin to Thrive Leads, and this one feature was the only thing missing. Now, I have a lot of questions/ideas. The plugin I’m using sends an encrypted download link, you can set an expiration date for the link, and it can be configured to act as the opt-in part before sending the details to the mailing list provider (in my case, I use Mailpoet with Sendgrid). I’m not sure if I would be able to replicate all this functionality with Thrive Leads in the future. I’d go for the horse sized duck any time. Imagine if you’d be able to tame it.. Although this doesn’t work with double opt-in, or am I missing something? This does not require an opt-in confirmation. That part is still up to the email marketing system that you use. Good point about taming the horse sized duck, by the way. With the way the question was phrased, I assumed it would be a battle to the death, so I didn’t consider that option. I was trying to figue out how to “simply” setup a lead magnet. And I got it. Hey Shane, it seems, that christmas is more the once a year! I am really impressed – if «Speed of implementation» had an URL it would be thrivethemes.com . Hi Shane…this is a great feature. Can you add the option to use an Amazon S3 link instead of only uploading the file to the server? It could be cheaper in the long-term since having the file uploaded to the server consumes the bandwidth and also adds more workload to the server. I’m loving this updates and I open each and every email. This is definitely the best platform for any marketer online. You can set any file location of your choice so this is already supported. Would an a/b split test option be possible? I like the idea of not having to create a thank you page. Is there a way to drop a pixel on the download link to keep track of funnel? Great feature Shane! Love how innovative and fast you guys are to introduce new features. Was wondering if you guys are working on any NEW plugins? Specifically, a scheduler- something like accuityscheduling or birchpress? I know Thrive would do a much better job than what’s out there. If I want to share your blog post, how do I add my affiliate link to it so I can use Buffer to Tweet it? The only downside is I have to rework the current setups to implement this better strategy. Keep up the solid work. This plugin is fantastic and keeps getting better each update. You guys keep raising the bar! LOVE it! I love this feature because I inevitably forget to create the Thank You page until I get to that part of the opt-in page setup, then have to stop what I’m doing and go create the page. I am in awe of the features & functionality that you guys keep adding. I think I’m probably going to be able to get rid of all other 3rd party tools I use and stick with just Thrive. Also wanted to say thanks for the great content you guys create. Your videos & posts are fantastic. LOVE the random question at the end too. Thanks for creating, supporting and updating such awesome products! I guess I’m confused. Can’t you achieve the same exact thing with a confirmation page? As it is right now in Thrive- I can insert the URL of a thank you/confirmation page for each form. Can’t I just put the link/info right there on the same page? This would also serve as a reminder for them to confirm their email… what am I missing? Yes, that’s correct. It’s a different way to accomplish the same thing. Depending on your setup, using Asset Delivery might be more useful or easier than creating separate confirmation pages for each opt-in offer. Once the Subscriber proceeded Confirmation another PopUp Plugin thanks him for the subscription and recently redirected to a previously selected page. All this; without leaving the page where the Registration Form, until the confirmation. Feature; which can be replicated in Treve Leads to send the download link once the Subscriber confirm your data. Thanks for the tip, Juarey. I’ll have a look at the plugin you mentioned. Great job Shane. That is a very good feature. God is not as smart as you ! It is exactly what i’m looking for because i have à lot of list in my autoresponder. So, Thank you so much ! I’ve been asking this to GetResponse forever (being able to deliver different freebies while subscribing on the same list), and they always ignored me. Big surprise there.. But along comes Thrive, and voilà, makes the others look like idiots, as usual. Well done guys, Thrive is by far the product where I feel I get the most value for my money, even though I don’t often often get the chance yet to use all these great additions. Keep it up, and you’ll keep my subscription until they make hotels on the moon. Oh and every time you pop out another little piece of awesome, I feel a shiver of anticipation for what Thrive 2.0 is going to be…”2.0” carries a lot of weight, I am counting on you guys, don’t disappoint! I am so glad I didn’t purchase Lead Pages because The Thrive Suite is a Lead Pages killer. Keep up all the great work you guys! Nice feature. Though i have to ask…. Are you saying they would get this link with the download in the WECLOME email?? im trying to understand how this integrates with an existing autoresponder. As mailchimp will only send out emails that have been customized inside your account. So unless we take a LINK from somewhere and insert it into say… welcome email. No one will get a link. Please clarify as right now this doesn’t make sense. This feature doesn’t interfere in any way with the setup you have in MailChimp. Meaning: they will get the Asset Deliver email as well as whatever emails you set up in MailChimp. The advantage here is that you can send different download links from different opt-in offers (e.g. content upgrades in multiple posts), without having to set up a separate list and follow-up email sequence for each one in MailChimp. The issue I have with this is that the user is send the link before he confirms his email address (double opt in). I’d prefer a way to have the download link sent to the user after they’d confirmed their email address, to stop users just signing up to get the content, then not confirming. The way to accomplish what you have in mind is to do it all through the autoresponder service and link to your download page from the confirmation email. Hi Shane, I really like you behind the scenes Q&A: genius!! And the way you answer these questions is even more genius! Thanks so ever for all your video’s!! And duplicate emails for each funnel. 1 niche=1 sequence, regardless of the landing page/incentive that’s used to join. And I can go back to my dear Wysija (mailpoet) plugin. It lacked features to do what I wanted and I had to use another service. But I missed its simplicity. In other words: ThriveThemes, you made my day. Great feature and best for content marketing. It will help to build emails list more smoothly. Great feature, Shane. Fantastic updates you guys are releasing. A few posters above have raised the issue of double opt-in. I appreciate what you’re saying about this being out of your control, but isn’t it that case that if you give them the download they want then they have no incentive to immediate confirm subscription to your list? I suspect that if I changed from giving them the download on confirmation of email address, and gave it to them immediately they clicked submit instead, I’ll see my subscription rates fall through the floor! I would not recommend using the Asset Delivery feature with a confirmed opt-in process. This is really only useful if you use single opt-in. More options – me like! Hey, here’s a quick feature request: how about making it so we can save our customized buttons (and possibly other created elements) in an “asset library” not unlike the templating options, so we can quickly select, add them to pages/posts/popups and edit them, without having to start from scratch? Due to the immense “tweakability” your stuff offers, not having to manually adjust all those settings from button to button (for example) would be a major time saver. Thanks, I’m very satisfied with ThriveThemes! We call them content templates and you can read about them here. ThriveThemes philosophy catapults you away from the competition. Glad to be part of it. Thank you very much, Brayan! This is amazing. I was just working through making smaller, easier to consume lead magnets, and having to look at doing all of these special thank you pages, and figure out what list to add to even though I’m using ActiveCampaign, like you. Thrive Themes is one of the best business decisions I have made in all of 2015. Thank you! How would I go about using a thank you page without confirmed optins? Can this be done? Other than the stock message we send out can we set up a page that they go to that they receive their link on. This really would make it perfect because thank you pages make a huge part of the way offers are made and obviously are a huge part of what people see just after they sign up. If you use a single opt-in process, the thank you page is simply the page you show the visitor immediately after they sign up. If you use Asset Delivery, you can create one “catch all” thank you page that tells your new subscriber to go to their inbox to get their download link. Excellent addition Shane, any chances we can customize the e-mail message? Yes, you can fully customize the email template for each downloadable asset you create. Thank you Shane! Now I can put the Lead Pages question to rest!! Keep it up man! Thank you for your comment, Brandon. Hi Shane, love this new feature. 1 thing though, instead of sending the asset through emails (which is not exactly free) how about redirecting them to a landing page? So it’s like this: if a user opted in for the first time, he’ll be redirected to a custom URL normally be a confirmation page telling them to verify their email. But if a user is already a subscriber, and he opted in again, he’ll then be redirected to another custom URL which is the asset page. This way, we don’t have to spend money for additional email service. This will also makes it more effective if I have more than one content upgrades and my visitors opted in more than one. That sounds like an interesting setup. I’m not sure we can do this with all the various email services we integrate with, unfortunately. What I’m trying to say is: by the time you have to start paying for Postmark, the few dollars it costs you will no longer affect your business in any perceptible way. Awesome feature and I’m REALLY glad I opted for the whole thrive theme suite last week. I haven’t got around to playing with it all yet – but certainly digging the fact that everyone can go on the same list regardless of their specific option choice. That’s awesome to hear, thanks Tony! This is great! I was getting a little crazy with my different lists for different content upgrade.. (and especially to send my newsletter only once to those who signed up for several freebies). QUESTION : what about double optin procedure? I am using mailchimp, and I think only those who click on the welcome email are added to the list. What if that email arrives initially in spam (or promotion in gmail), and those who have the freebie in hand never get to also receive my email sequence + newsletters ? Thanks in advance for the clarification !! I’ve added some notes about confirmed opt-in to the post. The short answer is that using Asset Delivery doesn’t change the behavior of your autoresponder system in any way. What your autoresponder does with the leads we pass on to it is outside of our control. Great upgrade Shane and team! Is there a simple way to do one-click upsells with thrive leads/or integrations? We don’t have any payment integrations at this point, so the answer is: no. Do you have to host the download files in your WordPress media or could you set it up so the download file is hosted on Dropbox or Google Drive? Your files can be hosted anywhere. The new support for content upgrades looks great. A couple of questions / notes – around the confirmation issue. A less than ideal but OK solution would be to allow for a delay before the email containing the asset is sent out. If you set a 1 minute delay, then the subscriber would at least get the confirmation email before the actual asset. But – and this is the question – is there really no way to make sure that confirmation happens through the API of the email provider? I know that would be extra work – but it’s really the only good way to use content upgrades for double-optin lists (which, I assume – most lists are). I doubt any email provider will accept anything other than their own confirmation mails for the confirmation process. If you are using a confirmed opt-in process, I recommend that you create separate forms and confirmation/download pages for each one of your opt-in offers. I don’t see an easier way of doing that. Shane, as always, you guys are the best value for the money I have experienced. You keep adding great new features to your products at no charge and believe me it is appreciated. This asset delivery feature is really great and will be a time saver for sure. NIce job. Thank you for your comment, Bill! Awesome tool. Not sure when I will use it but nice to know its there. Hi Shane, great idea with Thrive Leads Asset Delivery. BUT using another email delivery system is destroying the whole idea. I cannot and will not change my email supplier. How can I use my MailPlatform software instead of your Mandrill? The email delivery services don’t replace your current email marketing system. They also don’t interact with your current email marketing system in any way. The email delivery services are used only for sending these Asset Delivery emails and ensuring that they don’t end up in the spam folder. Fantastic!!! I’ve been looking for this exact feature :) So grateful to have found this. thank you. I just to see but to use “asset delivrery” I need to pay for another service .. not cool ! Well, the alternative is sending it through WordPress, which means sending it through your hosting account, which means the emails will quickly get filtered out by any respectable spam detection. A) Sending emails for free, but they never arrive in the inbox. B) Paying $0.0003 – $0.0015 for every new subscriber you get. Thanks for the continuous improvements. I know it might sound silly but I don’t know what you mean by Content Upgrade? Maybe I use a different terminology. Tomas…a content upgrade, at least by how I’ve seen it defined, is a specific gift, upgrade, file, or other opt in “thing” that is specific to the post as opposed to a generic opt in gift on a sidebar or at the bottom of each post. So, for example, let’s say your blog post is about creating images for your blog posts. (I’m on an image kick at the moment, so hope the example works). In the blog post you talk about how you don’t have to pay a fortune for images and mention a specific site. Your optin gift, content upgrade, could then be additional sites to find free images or tools to edit them or a checklist to make sure you complete all the steps to edit it before you put it in your blog. Any plan to integrate with other email delivery service like amazon ses, sendgrid or mailgun? We’ll definitely create more integrations that we see enough demand for, yes. Great stuff ! I’ve test it and works really nice. I’m also using it Amazon SES, and I think it would be nice to implement with amazon SES Assets Delivery or with a custom/defined SMTP service. Thanks for the suggestion, Tudor. We’ll look into this as a possible addition. As user above asked…. any possibility of also Integrating with Sendgrid and Amazon SES etc.? Thanks for awesome new feature BTW! Yes, we’ll consider adding more integrations, depending on what our users ask for the most. On more IMPORTANT thing. Why don’t you make your OWN CMS. I would gladdy pay for something stable and get read of wordpress with all tons of free plugins that waste your time, and all the updates that ruins your sites and plugin, inclusive the payed ones. You don’t have stabillity with wordpress. A smart CMS made for blogging, membership sites, ebook selling is what we need with all the thrive leads and thrive content builder integration, and all other good stuff. Let’s get rid of wordpress and make a cms for the marketers and clients. I don’t think that would be a great use of our time. WordPress isn’t perfect by any means, but it’s a good and widely supported platform. I think we can achieve more by building on this existing platform than by building something from scratch. If we built our own thing, we’d spend a lot of time just on the basics. With WordPress, we can fully focus on advanced and marketing-focused features, because the basics are already taken care of. I am using this feature now but what I want to delivery is a mp3 file. It is auto opened and played instead of being download when try to click to download it in email preview. What can I do? if I want the user to “download” it, not auto play it. It’s up to the browser used by the visitor (and perhaps the browser settings) what happens when a certain file type is clicked. If you want to force the download, you could create a zip file containing the audio file, instead of linking to the audio file directly. Thank you very much! Shane. By the way, I has been subscribed Thieve Themes nearly two years, as a website building starter, I find Thieve Themes provides great services to me. Appreciate !!! I’ve found this email service for transactional emails that offers 10k transactional email / month for FREE: mailgun.com. Looks good, yeah. I’ve added a note about this, so we can look into creating an integration. Hey Shane, this is a great feature. One thing that concerns me though is by doing the Single Opt-In as advised, my subscribers don’t get an email telling them that they’ve been subscribed. And even worse, I don’t get an email either telling me that I have a new subscriber. For the record, I’m using Mailchimp. I don’t know about notification emails for you, I guess that’s down to how MailChimp is set up. As explained in the post, for confirmed opt-in, the Asset Delivery feature simply doesn’t make any sense. If you want to use a confirmed opt-in process, then you should redirect subscribers to the download link after they click the confirmation link. If you’d use Asset Delivery at the same time, they’d get two emails and they wouldn’t have much of a reason to confirm their address anymore. Hey Shane. 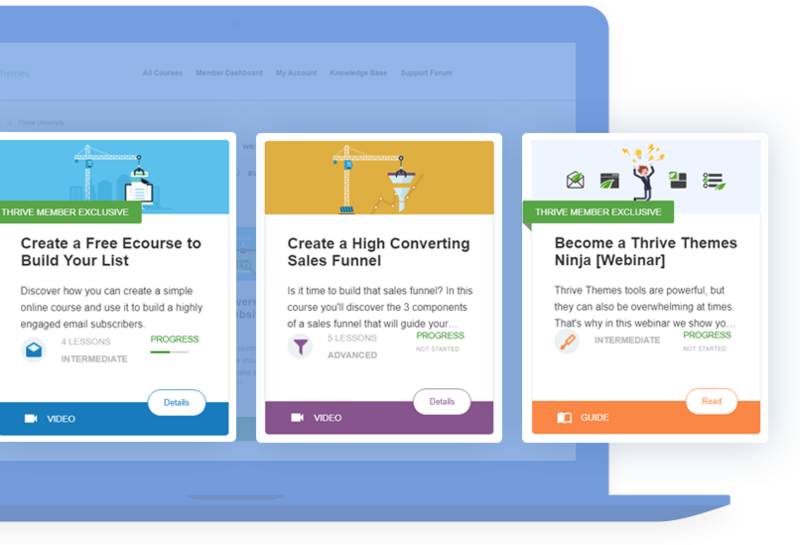 This is a breakthrough for competing with the simplicity of Leadpages for this kind of thing (or add-ons for things like Aweber which make it so time-consuming as you say). My only question is that it looks like I have to sign-up and pay for yet another app (eg. Mandrill or Postmark) when I already pay for my email service provider. How come it can’t just integrate directly with whatever service I’m already using? Perhaps this is possible down the track? Tim, I’m adding this Asset Delivery option and just worked through that question myself. This might not be exactly right, but it’s close. Services like Aweber and Mailchimp are built around a model of sign-up and then send batch emails. These would be automated emails or emails you manually sent. The key is all of these work around batch processing. Let’s say ten people sign up on the say day and all are going to get your automated 10-day emails of “how to be a better golfer.” The system batches out those emails in the sense that once signed up, they are treated as a group. And all of these people are added to a list. Asset management gets into one-on-one transactional emails when a list isn’t used. User does something and an email is automatically sent with information specific for that user. Their email isn’t stored in a list. It’s a one-time transaction. So a service like Aweber and MailChimp is about building a list and interacting with that list. Services like Mandrill are about sending emails with the benefit of the ThriveLeads API integration allowing that to be automated. Hope this helps. There’s a difference between email marketing and email delivery services. In general, a service that does one thing doesn’t do the other (or at least not as part of the same feature within the service). That’s just how the industry is. The pricing really shouldn’t be a concern though, considering the free tiers many of the email delivery services offer. A service like Postmark or Sparkpost can be used until you have tens, if not hundreds of thousands of subscribers. At that point, paying a small fee for email delivery really shouldn’t be a problem anymore. Am I able to use Asset Delivery with Mailchimp? If you are a MailChimp user, you can activate their email delivery feature in your account (called Mandrill) and use it with Asset Delivery in Thrive Leads. Thanks Chris – sounds like it would make sense! Bit of a pain but I’m going to give it a try and see what happens! All the upgrades are well done and extremely useful. You guys also do a great job of explaining them with the short tutorials. Always good stuff and strong value here at Thrive Themes! Hi, I’m new to thrive leads and I want to use offer a video as an asset for delivery. What is the best way to do this? Host your video on somewhere like Amazon S3 (or another host of your choice) and then link directly to the MP4 file (or whatever file type it is). Thank you for the suggestion, Widmaer. Sounds like it could be an interesting addition. Great feature which is very easy to set up! However can you please explain the benefit of using this over an active campaign automation? The benefit comes in when you want to add people to the same automation and same list, from different signup forms with different downloadables. So, you can have free report A and free report B, ensure that everyone gets the one they signed up for, but also send everyone into the same automation. Shane, where is this in the updated version of Thrive? I can’t seem to find the exact area since this used to be in….. Setting up the asset delivery has been a real pain. Im using Mandrill. I have my domain verified and my DKIM and SPF settings confirmed. My SMTP options for a “from email” are correct as a test email from wordpress sends through mandrill. However when I go to test an asset delivery it fails and does not send. I cant seem to find an in-depth tutorial for setting up mandrill with thrive leads asset delivery. Anyone have any ideas why my test email works but my asset delivery does not? Absolutely awesome! There i was struggling away looking for Dropbox or AmazonAws … Now for me this is so incredibly brilliant for all my content upgrades! Genius technology quite the best! Does this mean that after Thrive Leads sends out a certain number of content upgrades, I will have to pay something extra? Yes, the email delivery services will charge a small fee after the free tier is up. In the meantime, we also integrate with other services. You can definitely find something where the cost-factor is negligible. Sorry to ask a silly question as beginner, I don’t understand everything to implement it. I followed your advice and use now ActiveCampaign, but for creating asset delivery (step 1: choose email delivery service), it seems that is only proposed to choose among 4 other mailing systems ? Shane, it looks like this is what EXACTLY what I am looking for. Well done explaining the pain points of creating the new autoresponder opt in forms etc. yeah, great feature, but what about Sendgrid ? are they on your plans for future developpement ? You can check out our integration with SendGrid here. Shane This stuff is very cool. As a newby i want to point out that i would like to know if there is an easy way to export landing page specific opt in forms and light box to Thrive Leads ? problem i have is that if I want to use thrive leads feature with thrive template i have to go and recreate optin forms and light boxes to be able to profit from the benefits as asset delivery. I wish there was a easy way. Right now, unfortunately the answer is: no, there isn’t. We are working on a major update which will unify the lightboxes, so that there will no longer be separate lightboxes for landing pages on the one hand and Thrive Leads on the other. for someone already setup with Mailchimp, was disappointed to see it actually was easier to just do things as usual than to use asset delivery which would require a whole new set of service sign up and hoop jumping. Will using this asset delivery system protect my content on my site from people downloading it who have not opted in or purchased my ebook? Or do I need to integrate another service like easy digital downloads to protect my content? If so, who do you recommend as a service? It would be great if TT and AC were enough to securely deliver paid content. I love how you always come out with relevant features and how the videos clearly explain the purpose and use. In this case, though, isn’t the purpose to add people to your email list? And if they don’t confirm their email address, then your next email from ie. mailchimp will end up in the spam filter anyway. Or did I misunderstand the end goal? The asset delivery does not actually add people to a list. So this is not what you’re looking to do here. Hi Shane, this awesome feature is not available anymore for emailproviders like Mailchimp or Mailerlite, is it? Is there a plan to include the [lead_email] shortcode in the Email Template as well? Not only the pop-ul version? We’re looking for a way to track what emails downloaded the email and in order to do that we will need the email address. We would like to have a custom download link for each of the subscribers from which they can download it a maximum of n times, so that they won’t share the link directly with others after subscribing to the list. No you need to use the email delivery service and not the email marketing service so you need to use Mandrill. Love the concept — this is why I changed to Thrive…I am having trouble with finding the Asset Delivery Option. I don’t have a pop-up with Lead Generation options above my form when I click on the form. The lead generation options have moved to the sidebar. When you click on the form, you’ll see the option for connecting to a mailing service at the top of the editor sidebar now. Hi! I’d like to set up Thrive Leads Asset Delivery with Email Delivery Service Klick Tipp. But I can’t select it, all though the Settings for the API Connection are done. Is the set up only possible with few services, which are listed? 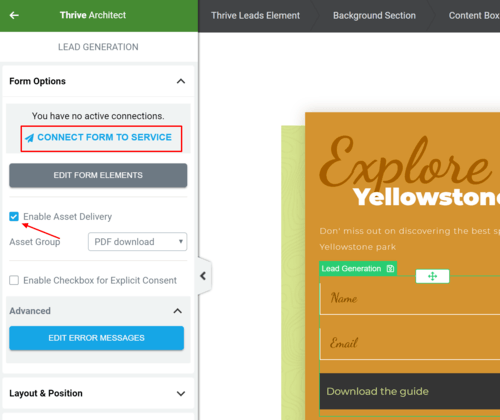 Thrive Leads supports drip.com as a email responder but this service is not available in this Asset Delivery function. When can drip.com be supported? For the asset delivery service, you need to set up an email delivery service. Not an email marketing service. You can learn about the difference and the reasons here.